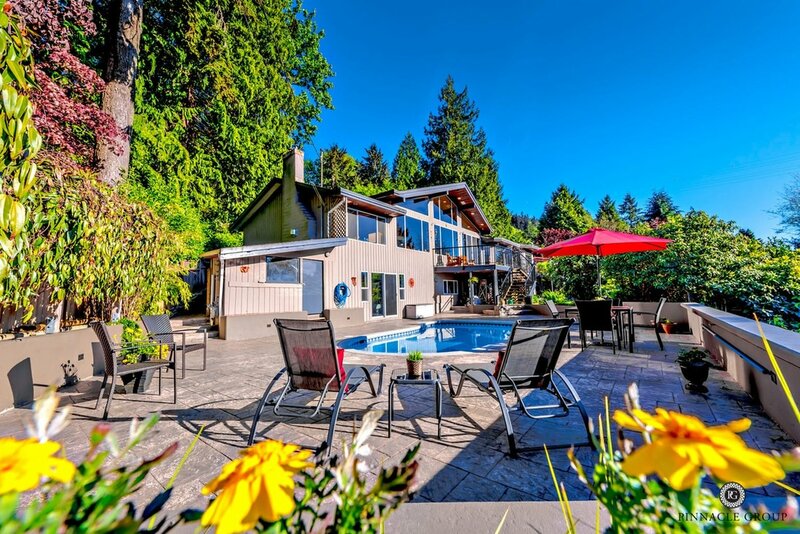 ​Resort living at its finest in Belcarra. Nestled in serene, lush manicured gardens overlooking the sparking ocean and aqua swimming pool with mountain vista views in the background find this gorgeous executive family home. Enjoy expansive exterior deck spaces for summer barbecues, fabulous poolside area featuring stamped concrete with pool shed and hot tub area, and the tranquil waterfall feature. You will love the open concept floor plan featuring beautiful renovations inside with expansive windows taking in the stunning views with an abundance of natural light. The gourmet kitchen featuring high vaulted ceilings, new marble centre island top, 6-burner gas range, Sub Zero, Kitchen Aid, Bosch appliances & custom cabinetry. Downstairs offers a den, two large bedrooms and a second kitchen perfect for family or in-laws. Extras include in floor radiant heat, A/C, security system, steam shower, surround sound and more. Located on quiet street just minutes from the Park, White Pine Beach, walking trails, Buntzen Lake and vibrant Port Moody, Newport Village and Rocky Point. Come experience the best of West Coast living. Floor Area: 3,178 sq. ft. Lot Size: 7,850 sq. ft.